Learn how to properly uncoil on the inside-out forehand! This entry was posted in Tennis Instruction Videos and tagged advice, ATP forehand, ATP tennis, bay area tennis, biomechanics, drills, forehand, forehand biomechanic, forehand drills, forehand fundamental, how to hit the modern forehand, how to use the core, how to use the hips and core, inside-out forehand, learn the inside-out forehand, learn the modern forehand, modern forehand on November 27, 2014 by simplemoderntennis. Being able to control topspin and trajectory on the forehand is crucial in today’s game. A great forehand is a versatile forehand! The amount of spin on the ball is determined by the amount of upward motion you apply with your racket to the ball. Which player will impart more spin? The player with the buttcap pointing diagonally upwards to the ball. The straighter the buttcap is to the ball, the flatter the shot will be. Though, people argue that it is a hassle to constantly think how diagonally they have to point the buttcap so here’s an easier alternative: the type of follow through. Djokovic is a prime example. He uses three follow-throughs on his forehands: by the shoulder, over the shoulder, and the reverse follow-through. He is probably the player on tour who employs three different follow-throughs on his forehand during a match the most. Djokovic’s by the shoulder follow through is normally used for more aggressive flat trajectory shots. He will often use this forehand on sitters, high balls, and balls he deems worth punishing. Djokovic’s over the shoulder follow-through is typically used for a safer and more-spin net clearance shot. He tends to use this follow-through a lot when grinding out points. You will often see him go cross-court with this forehand. He can also create good angles with this shot. Djokovic’s reverse follow-through is often used when he is late with the ball and/or when he is going for a lot of spin. This shot is very effective in creating sharp angles/heavy bouncing balls and is a very safe shot. However, this should not be your standard forehand rally ball because this shot is not as penetrating and will tend to give short balls to your opponent. Each of these follow-throughs produces different effects on the ball. The ability to use all three will give you a variety of options with your forehand, allowing you to better construct points. Djokovic has improved a lot in this aspect of the forehand which is one of the things that has greatly attributed to his success in recent years. This entry was posted in Analysis of Pros, Tennis Instruction/Tips and tagged ATP forehand, bay area tennis, bernard tomic, coaching, flat forehand, forehand drills, forehand fundamental, forehand technique, how to hit the modern forehand, improve forehand, modern tennis, novak djokovic, online tennis instruction, strategy, tactics, tennis coach, tennis lesson, tennis strategy, tennis tips, topspin forehand on October 26, 2014 by simplemoderntennis. ONE THING THAT REALLY MAKES KEI NISHIKORI A DANGEROUS TENNIS PLAYER? The reason why this style is so effective because tennis is really a game of cutting time away from your opponent. Say you are hitting your shots at a constant pace and you are five feet behind the baseline. What difference would it make if you were two feet behind the baseline? The amount of time you are cutting away from your opponent: his time to load and time to get to the ball. He will be running from corner to corner more if you were two feet behind the baseline versus five feet behind the baseline. If you were five feet behind the baseline, the way to equal the amount of effect you apply when two feet behind the baseline is by upping your pace enough to match that effect. For example, Robin Soderling has crushing ground strokes, but he does not as play close to the baseline as does Novak Djokovic. However, because of his power, he is able to keep up with Djokovic being close to the baseline. But what if you upped your pace and played closer to the baseline? You will be adding even more pressure to your opponent now. One thing to note though; to play close to the baseline, you must be quick on your feet and Kei Nishikori is a perfect example. Nishikori plays this style remarkably well, which is one of the reasons why he has respectfully earned his way into the top 10. 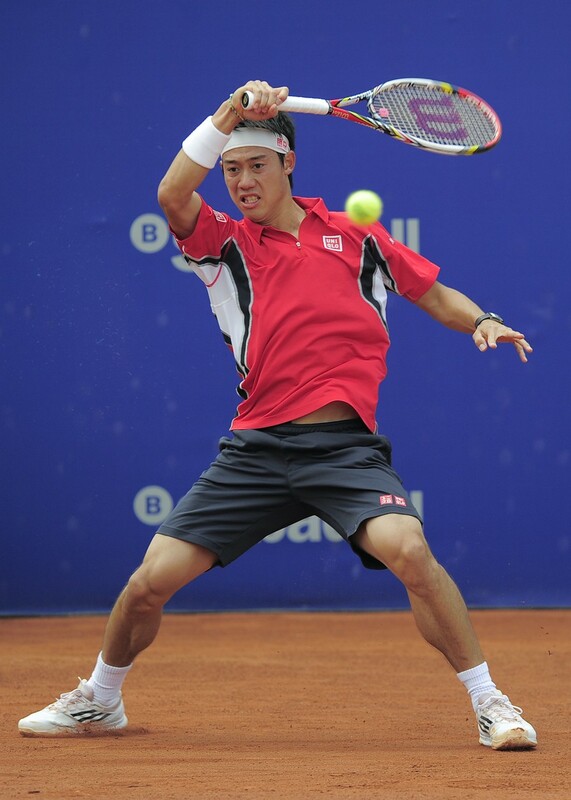 Nishikori is able to accomplish this ability because of his compact AND powerful strokes on both wings, forehand and backhand. His compact strokes allows him to take less time to load which makes it easier for him to play closer to the baseline. Also, the fact that he can produce firepower in his groundstrokes is a major plus for his style of play. With his power, he is putting tremendous pressure on his opponents, blowing them from corner to corner and greatly taking their precious time away to load properly. Similar to his ground game, Nishikori will always try to take time away from his opponent when returning his serve, especially the second serve. If the shot is placed with good depth and placement as well, this will put more pressure on your opponent and give you control over the point in the very beginning. With his great returns, he is able to break his opponents more often than most players. Nishikori, being a specialist at taking time away, is a difficult player to beat. You will see him often times effortlessly hitting winners past you and behind you. In addition, because of the tremendous pressure he applies, you will see him many times following up with a volley to end the point knowing that you will float him one. With his swiftness and aggressive playing style, he is a force to be reckoned with on the ATP world tour. This entry was posted in Analysis of Pros, Uncategorized and tagged advice, american tennis, ATP forehand, ATP tennis, backhand, backhand technique, bay area tennis, biomechanics, california tennis, coaching, drills, forehand, forehand biomechanic, forehand drills, forehand fundamentals, forehand technique, how to hit the modern forehand, japan, japanese tennis, kei nishikori, online tennis blog, online tennis instruction, tennis strategy on October 26, 2014 by simplemoderntennis. Hey guys! This is Marc’s final session of the 8 hour package. He came to me with a very old school forehand – his grip was continental! But ever since we have worked together to transform his forehand into the modern forehand. Today we focused on weight transfer of the legs and really made our last effort on trying to work on his contact to be more closed. In addition, we tried to emphasize the footwork and hit inside-out forehands. It’s been a great 8-hour package with Marc! This entry was posted in Uncategorized and tagged forehand drills, forehand fundamentals, forehand technique, how to hit the forehand, how to hit the modern forehand, instruction, online tennis blog, online tennis isntruction, tennis advice, tennis blog, tennis coach, tennis tips on July 15, 2014 by simplemoderntennis.